This time it was a Drake. Actually a pair of Drakes. Yooch had discovered them in the process of assaulting a sleeper compound. They weren’t fairing well. A steady barrage of missiles rained down on the two battlecruisers and their shields crackled ominously. Yooch approached slowly under the cover of his cloak, wondering if he should engage. He had taken down a single Drake before, but two might be a challenge. His deliberation was interrupted when one of the pilots suddenly activated his warp drive and disappeared from sight. The second was quick to follow. Intrigued, Yooch followed their signatures back to the force-field where their ships were stored. One of the pilots had switched in to a Raven, and both were accelerating into warp again. Apparently the Drake wasn’t strong enough to take on the sleeper drones and the pilot was hoping a battleship would fair better. Yooch followed them back to the compound and began to creep forward again. He wasn’t really sure what to do about the battleship, but maybe he would be able to destroy the Drake before the Raven was able to lock onto his ship’s signature. However, it wasn’t long before they both aligned and activated their warp drives, disappearing once more into the vacuum. How peculiar. He was sure they would return, and waited at the edge of the compound. Sure enough the Drake reappeared on his directional scan within a few minutes, accompanied by….a Chimera! A Chimera? For this little compound? This was a blatant breach of the articles of the Yulai Convention concerning “excessive force”. Yooch immediately drafted an urgent memo alerting Rall and Storm to the violation. However, in the time it took for the light-distance broadcast to transmit the Chimera obliterated the compound and returned to safety behind the force-field. Yooch wasn’t about to let it lie. This Chimera needed to die. For the next several days he scanned the system every few hours, bookmarking the location of every anomaly his electronics could locate. He reprogrammed his ship’s signature each day to remain inconspicuous. Many unstable wormholes appeared and collapsed, occasionally bringing company with them. Yooch let nothing distract him from the goal, however. He needed to know exactly where the Chimera would appear next, and he needed to have backup ready when the time came. Between scouting and surveying the system, Yooch contacted several groups to enlist their help. His own corp-mates from End-of-Line promised their assistance should the Chimera reappear. Several of his old Darkstorm colleagues were readily available as well and promised to bring members of their new corps, Anomalous Existence and Empire Wars. 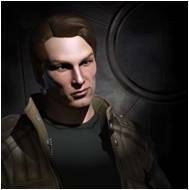 Using discrete wireless queries, Yooch was able to collect quite a bit of information on the Chimera pilot and his cohorts. They were part of the corporation Sons and Daughters of Mandalore, and as the days passed Yooch was able to identify several unique pilots. Watching their actions, he almost felt he knew them personally. Gabriel Thanduil – An expert industrialist. He manages colonies on all the planets in the system. Although he doesn’t enjoy combat, he owns a Deimos and isn’t afraid to defend himself. Misty Shadows – She’s the backbone of corporate intel. Fearlessly scouting the system every day in a Magnate she collects bookmarks and directs corporate operations. A few of her quirks include scanning in a Noctis and attempting to combat probe cloaked ships. Cassuz Fett – His heart is in the right place, but he has a lot to learn. He follows Misty and Spacemarine in a Drake and imitates their actions carefully. Spacemarine7212 Estemaire – The financial backer and director of the corporation, he flies the monolithic Chimera. The other corp members follow his direction without question. On the seventh day, Yooch waited patiently outside the force-field as the Sons and Daughters of Mandalore readied their fleet. There had been many false alarms over the week, but he remained as alert as possible as two of their pilots boarded Tengus. Suddenly, Spacemarine warped into the force-field and boarded the Chimera. Screaming into the microphone, Yooch broadcasted alerts to each of the reserve fleets. Bert7 responded quickly, bringing a Phobos to a nearby high-secuirty system. Gunner GzR and Anomalous Existence arrived soon after with a small armada. Trying to direct End-of-Line and communicate with the other corporations, Yooch employed excellent multitasking skills and located the Chimera. He had moved to another sleeper compound and was tearing through it with the support of the two Tengus. As the fleet moved in to position, the last drone structure disintegrated in to dust. Yooch called for the Phobos to enter the system as he warped close to the Chimera. Just then the Tengus warped off grid and the Chimera slowly swung around and began to accelerate. Afraid that it would enter warp before the Phobos could jam it, Yooch decloaked his Nemesis and immediately jammed the giant ship. He orbited as fast possible and held the point until the Phobos appeared. The carrier’s drones were ripping through the last of his shields as Yooch finally pulled the bomber into warp and left the scene. Turning the fleet over to Gunner GzR, Yooch warped back to the entrance wormhole to direct the rest of the fleet’s entrance. Cara passed him there on her way to the battle in a neuting Legion. As the last members of End-of-Line reached the system, the Chimera was taking heavy damage. The excellent guardian pilots from NOMEX had ensured that it’s fighter drones were not able to destroy any friendly ships. Yooch was able to warp back to the field in time to see the hull of the giant ship catch fire before it exploded, spraying debris tens of kilometers in every direction. The fleets congratulated each other on punishing the breach of public policy and returned to high security space. Yooch docked up in the nearest station and took a much-needed shower while he though about where to head next. There was a bright future ahead of him in this corp – but for Spacemarine – this was the End-Of-The-Line. EVE Mon, it’s you and me. You show me my destiny! In a POS we can’t defend! EFT will pull us through! E-V-E Mon, gotta skill ’em all! With cov-ops, I will face. But it puts you in your place. Ensign Yooch drifted idly. He had spent the last few hours scanning out wormhole systems, looking for a connection to high-security space. Darkstorm Corporation had businesses to attend to in null-security and needed a reliable route to the market in Amarr. It had been quite a lot of work to find one and the route took them through several class 5 systems with signs of recent activity. However, there was no activity now. The only ship he had encountered was a Heron sitting inside a force field, scanning cosmic signatures with combat scan probes. Why people would ever do that was beyond him; combat probes were so inefficient compared to the specialized core probes distributed by the Sisters of Eve. The Heron was long gone though, and Yooch decided to warp through the system chain and check the wormhole connections for stability. Each one he passed through was empty, the directional scan on his Nemesis registering only space debris. When he reached the last system, however, his directional scanner lit up like a small bomb, flashing and blaring warnings. Hurriedly cloaking his ship, he stared dumbfounded at the screen. A Golem? He quickly warped to the force field where the Heron had been earlier, but it was empty. Perhaps it was at the wormhole connection to high-security space? He checked it as well, but no marauder was present. Clearly the Golem had to be stopped. Yooch fired up comms and started yelling orders at his superiors. They had been napping in the barracks, but came quickly came alive at the word Golem, even choosing to ignore his impertinence as they rushed to their ships. They were several systems away though, and would take some time to arrive. In the meantime, Yooch pinpointed the target. Sure enough, he was battling a swarm of sleeper drones and dragging their wrecks behind him with giant tractor beams. As Yooch slipped nearer under his cloak he had to be very careful to avoid the horde of sleepers and hobgoblins zooming around at high speed. Any stray drone would decloak him by proximity and reveal him to the marauder. More waves of sleeper drones warped in and engaged the Golem as the team assembled in a nearby class 5 system. Yooch carefully checked his systems and got ready to decloak as he inched within 9 km of the monstrous ship. Curiously, the Golem launched some cheap core probes and started scanning. Did no one understand how much better the Sisters of Eve variety were? With his backup in place, Yooch switched off his cloaking device and turned on everything else, activating two warp scramblers on the Golem and nailing it with a volley of torpedos. He knew that he would have about half a minute before the marauder was able to lock on to his small ship, which was plenty of time for his corp-mates to arrive. Unfortunately, the sleeper drones responded much faster. Sensing easy prey, they immediately locked on to his Nemesis and began firing. Yooch held his ground, despite the huge damage inflicted on his shields and armor. He needed to keep the warp scrambler on the Golem until his team arrived. Just then however, he was blasted backward as the marauder activated it’s bastion module, going in to defensive mode. His scramblers were deactivated as heavy interference blared from the giant ship and made it impossible for them to function. His corp-mates had arrived, but Yooch was still taking heavy fire from the sleeper drones. Realizing there was no reason to stay on field with the Golem immobilized by its bastion module, Yooch activated warp and started to align to a distant planet. Missiles and gunfire exploded on his vaccum-shield as he sped up and started warping. Reaching warp speed, he zoomed away from the field, but not before the last of his ship melted away, leaving only his protective capsule to guard him from the sucking vacuum. Yooch listened to the comms as he bounced from planet to planet in his capsule. The Golem was no match for the gang of strategic cruisers. Astrivia neutralized its capacitor instantly with his Legion and the other ships burned through it’s armor and shields easily. The marauder dropped extremely valuable deadspace modules, which were given to Yooch to help replace his Nemesis (and buy many more). Scouting is an expensive occupation, but hey, it has its rewards. TLDR: Daytripping alone in a Golem is a bad idea. Ensign Yooch was pretty doped up on boosters. He had recently had his wisdom teeth out, and was taking four different IRL (inconsistent relief lozenge) pills to dull the effects. He really shouldn’t have been flying in this state, but there was so much to do. His corp-mates had long since forgotten how to scan and hence relied on him to scout out new chains each day…. So far it had been a quiet roam. He had scanned down several wormholes linking systems in deep space and saved their locations for later use. Yooch observed each system silently in his cloaky Helios, using his directional scanner to search for signs of life. He passed through several class 4 systems without spotting a single ship. Jumping through a wormhole to a new class 2 system, Yooch went through the normal routine, bookmarking the wormhole exit and checking his scanners before dropping probes. Everything was quiet, so he began to warp around the system to get a better read on his scanner as his scan probes began to locate new signatures. Halfway through warp, his d-scan beeped and a hit flashed on the screen. Sitting up abruptly, Yooch was just able to make out a junky looking ship, perhaps a Minmatar Scythe, before the screen blanked out again. So he wasn’t alone in here. Interesting. What was a lone Scythe doing out in deep space? There was no sign of a force-field on the scanner, and those were hard to miss. It was strange though. Remote logistics ships didn’t usually fly alone, especially out in these far reaches of the unknown. Reaching his destination, Yooch checked the scanner again, but it was empty. His probes reported only a few signatures in the system, so he resolved to focus on scanning and complete his task. The Scythe nagged at him though. Where had it gone? Who piloted it? Where was their fleet? Enough of this nonsense. When in doubt, probe it out! He recalled his cosmic signature scan probes and launched combat probes. If there was a ship uncloaked in his system, they would find it. Sure enough, after a few scans he had located the signature pattern of a ship that matched that of a Scythe. The positioner located it far from the orbit of any planets, outside the range of his directional scan. No wonder he had only glimpsed it mid-warp and had been unable to locate it from a standstill. As for why it was there, well there was only one way to find out. Landing just a few kilometers from the Scythe, Yooch slid into visual range under cover of his cloak. The Scythe had obviously seen better days. Even for a Minmatar crap-bucket it was pretty warn. Deep scratches covered its wings and the remote shield-repair units were beginning to melt at their tips from overuse. Yooch scanned the ship with his local scanner. It was unmanned! He quickly transmitted his discovery back to home base. His cousin Cara had trained to fly these ships. Not because she had any aspiration to own a flying mobile dump of course. They simply required the same piloting skills as the noble Bhaalgorn. She replied that she would be there as soon as possible. which Cara taped to the vacuum-shield of her shuttle before clambering in to the Scythe and firing up its engine. Yooch followed her away from the system and showed her the route to empire space, where they planned to strip the Scythe and sell its parts on the market. The two of them laughed as they sold their spoils, imaging the reaction of the Scythe’s owner when the shuttle was found. Apparently he wasn’t nearly as amused. Ensign Yooch might be a right little wormhole saint, but Cara Forelli has a dark side. She recently engaged in some dastardly deviancy that made even Trigoth question his morals. I was scanning idly and chatting with a prospective corp-mate when Faded suddenly announced he was on grid with a Navy Augoror in C2A. Yooch was pretty far out, so I grabbed Cara and set off down the chain in a Harbinger, ready to bash heads in. Jumping through C4A to C2A, I got the green light from Faded and landed on the connection to C5A. The Navy Augoror had warped off a few minutes before so I sat at the hole waiting for it. After a minute or so a Legion lands and locks me up, so I point him and start shooting. Right after I’ve committed, a Proteus, Harbinger, the Navy Augoror, and a Falcon land and join in. This isn’t going to end well for me. The Legion is in half armor, but he’s completely neuted me out and my armor is starting to take damage. Our inbound Rupture, Hurricane, and Onyx are not going to save me, but maybe they can at least clean up the Legion. However, some people are just risk adverse and boring. The Legion and all his friends jump and warp off to their POS as soon as their free kill is in question. It’s the third fight of the evening we’ve been denied and it’s getting old. I head back to the POS to rep my armor before bed. Yooch is still scanning and wrapping up the recruiting conversation, so I fit a local repper and fix up my own armor. Faded is feeling pretty snubbed so he heads back to C5A to see if we can get in a gank. It turns out they are closing the hole, and he gets himself closed in. Ah well, they have a lowsec. But it turns out the high-sec in C2A was never bookmarked from the outside. I’ve logged out Yooch for the night and I’m feeling lazy, so I just head over in my Harbinger. I see scan probes in C4A but I’m not worried; we saw a neutral buzzard in there earlier. I bookmark the other side and spend a few minutes scaring the local ice miners while Faded makes his way back in. On our way back through the chain, we see a venture on scan in C4A. Everyone knows you can’t catch those, but what the heck. Faded drops combat probes and warps to him in the Anathema. The venture reacts immediately and warps to the C2A hole, where I’m sitting cloaked. I jump through with him for funsies and get polarized. Woohoo. By the way, I never put the plate back on my harby. Still using a medium repper. Awesome. The venture warps to his POS and comes back in a Tengu. Whoops. I consider pointing him, but my backup is pretty far and other ships start appearing on d-scan. So I lead them on a merry chase, from planet to planet and back to the hole to give my team time to assemble. Back at the hole, I let the Tengu engage me, but I drop fast without a plate and I’m forced to jump through (right as my polarization timer expires, phew). Faded is waiting on the other side, but they don’t follow. Frustrated again, I head back to the POS to get a freaking plate on my ship. Back at the C2A hole, our team is assembled. I come up with a plan. The Tengu pilot knows that I used to have an active rep, so I’m going to warp to the high sec and act like a carebear. I jump through, align slowly and warp to the high sec. After a minute or two, I jump back in to the C2 and slowly align to the C4. Right on cue the Tengu decloaks on grid, and I warp to the C4, but he doesn’t follow. This guy is very cautious. Faded is keen for a fight and urges me to type in local. This is the best I could come up with. Cara Forelli > can I run c2 sites in a harby? Bingo! Convo request. Much shameful emotional manipulation followed, including several boldfaced lies. Cara Forelli > you live in here? Fukurokuji > you live in the c4? Fukurokuji > you live in J115547? Cara Forelli > oh you mean at the wormhole I’m at now? Cara Forelli > I thought it was really good in wormhole places? Cara Forelli > does that mean I can’t bring big ships though soon? Cara Forelli > is there gas sites in there? Cara Forelli > should I hide? Cara Forelli > well would they kill me? Cara Forelli > do they know where I am? Cara Forelli > if I go in this wormhole will they know? Cara Forelli > but I don’t think it has good scanning skills or something? Cara Forelli > can my battlecruiser fight the bombers? Cara Forelli > so I don’t need to hide then? Cara Forelli > is there something that would be even? Cara Forelli > oh. are you good at fighting with people? …and manages to evade us on the other side and cloak up! It is truly not our night for PvP. On the bright side, I don’t have to feel bad about his t3 loss. We invited him to comms for some laughs and he turned about to be a pretty cool guy. Hey, at least he engaged, which is more than can be said for certain forum warriors we encountered an hour before! Rate my acting? I think I make a pretty decent noobie if I do say so myself. Yooch spent a lot of time admiring his new Helios. He had worked hard to learn how to fly it and had spent the last few days zipping around between the stars, completely hidden by its state-of-the-art cloaking device, so when Warb mentioned he needed a route to high-security space Yooch immediately volunteered to scan it for him. Teaming up with Divine Aura, they were able to scan through systems fairly quickly, jumping through wormholes in search for a connection to known space. The systems they visited were fairly quiet. Yooch saw a station once on directional scan, but there were no ships anywhere to be seen. Fairly soon, Yooch had scanned down wormhole signature estimated by the computer to lead to high security space! After a short fist-pump for besting Divine at something he announced his discovery and entered the portal to find out where it would lead. Exiting the dark void, he got another pleasant surprise. He had entered Kor-Azor Prime, a border system to a major trade hub! That was about the best you could hope for in a route to high-security space and Yooch held his head high as he entered the portal coordinates for his corp-mates use. Distracted by his discovery, Yooch failed to remember to cloak his ship after exiting the wormhole, a fact that he was quickly reminded of when a Rapier suddenly dropped out of warp right next to him. Dashing around the cockpit, Yooch cloaked up and started burning away from the portal, before remembering that combat in high security space was always detected and punished by CONCORD. Which was a good thing too, considering a Drake and a Helios warped in a few seconds later. They were obviously from the same corporation as the Rapier, judging from the logos painted on their hulls. What followed was strange; all three ships sat immobile next to the wormhole. Were they waiting for someone? Why weren’t they entering? Suddenly it hit him – they were scared! They had glimpsed his Helios before he cloaked and were afraid that his corp-mates would be waiting for them on the other side of the wormhole. Yooch laughed as he sat cloaked in his ship, allowing the power trip to go to his head slightly. It was amusing for a Rapier to be afraid of a Helios. He didn’t have to wait long. The ships seemed to decide it would be unwise to jump through the wormhole and warped away, toward one of the stargates in the system. Yooch remained at the hole a bit longer. Deciding that they were gone for good, he set course for the library in Amarr; there were some piloting skills he hoped to read up on while his corporation still had access to a major empire system. Yooch was sifting through dusty volumes when Warb announced he was ready to make a supply run. Since Warb had a lot of valuables to sell at the market, Yooch jogged back to his ship with as many books as he could carry and set a course for the wormhole to scout the chain. By the time he reached the hole in Kor-Azor however, Warb was already exiting it in a stealthy hauler. With no pressing reason to return to the market Ensign Yooch jumped back into unknown space and initiated warp to the next wormhole in the chain. Just then Warb transmitted something strange – a Magnate was jumping through the wormhole in Kor-Azor Prime. Who would bring such a primitive scanning ship through a hole with so much activity? Warb ran a scan on the ship and was able to ascertain the pilot’s name – Art Noble. Lacking any weapons on his Helios, Yooch maintained his course for corporate headquarters, running a database check on the mysterious pilot as he went. It turned up a result just as he reached the ship hangar. It was a graduation certificate from a capsuleer vocational school, only five days old! Art had apparently been planet-side until less than a week prior and was already flying through incredibly dangerous space. Entering the barracks, Yooch found Divine Aura wrapped up in an IRL (Instant Relationship Lecture) radio transmission with her needy boyfriend. No problem, he could take care of this on his own. Returning to the ship hangar, he boarded his speedy Atron and set off down the chain towards the Kor-Azor Prime connection. Reaching the system, he immediately noticed the Magnate on directional scan, as well as basic scan probes. However, the entrance to the wormhole was clear. At least Art had learned how to take basic precautions in capsuleer school, but he still needed a lesson in the dangers of wormhole-space. Yooch set about locating him, pinging each planet with his ship’s directional scan. Getting a hit, Yooch warped to the planet and landed just 5 km away from the Magnate. Flipping on his sensor booster, he burned towards it. His Atron was able to lock on to the Magnate almost immediately and prevent it from warping away. Yooch fired a few rounds of antimatter through its shields to put the fear of Bob in the rookie pilot before deactivating his guns. Not wanting to destroy the ship completely, Yooch hailed the pilot. Receiving no response, he shot a few more rounds to get his attention and hailed once more. Still nothing. He was becoming increasingly uncomfortable with the situation. Who knows which passing ships could have intercepted his message? He couldn’t stay here indefinitely toying with the Magnate. Steeling himself, he fired a few more rounds and watched the ship go up in flames. The rookie’s escape pod warped out immediately when the ship burst, which was something to be said for him at least. Yooch scooped the pitiful loot and headed back to headquarters with mixed feelings about the engagement. He was trying to teach the pilot a lesson, but perhaps he had been too harsh. En route, he received a weak broadcast. Decrypting it he could see that it was sent from Art’s pod. The pilot had finally seen Yooch’s previous broadcast in his pod’s data log. Apparently he had been too concerned with trying to escape to notice it before. From the transmission, Yooch determined that Art had never heard of unknown space before. Apparently since graduating, he had discovered a wormhole linking two empire systems and wasn’t aware that they often lead to more sinister domains. Ensign Yooch opened a direct radio link and explained about the dangers of unknown space. As is the way of capsuleers, Art was curious about the riches available in wormhole systems. Yooch warned him of the deadly sleeper drones that jealously guard ancient secrets but encouraged him to keep exploring. Remembering how difficult it was to replace a ship when starting out, he wired Art ten million interstellar kredits to soothe the burden. Yooch returned to the headquarters to help out with his daily chores, smiling as docked his ship in the hangar. Any day he could make a new friend was a good day in his book, and he was glad to teach a new pilot some tricks of the trade. Of course, some of his corp-mates would laugh when they heard about the ISK donation, but hey, who cares what they think anyway? I love to program. I love EVE. How can I use these facts to waste an entire weekend? 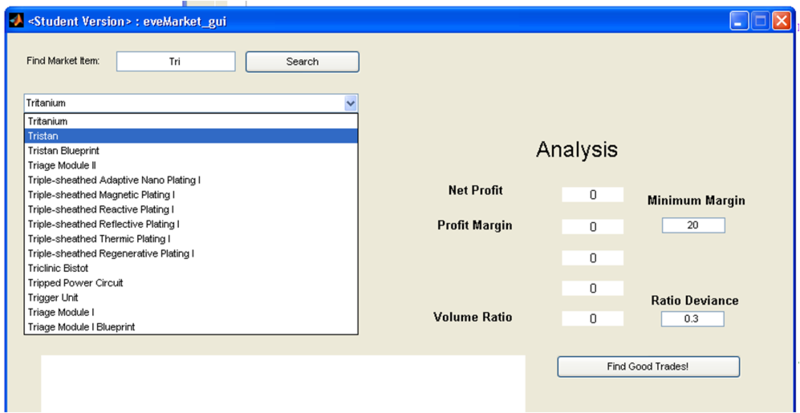 The program lets you type a few letters in the upper left and hit search to get a list of market items. I downloaded a look-up table with the IDs for each item so they can be matched to the names seen in the list. When you select an item, the ID is found and the Eve-Central site is queried for current market data in Jita. I was very pleased that this process was had no noticeable delay for a single item. Raw aggregate data from Eve-Central is displayed on the left. 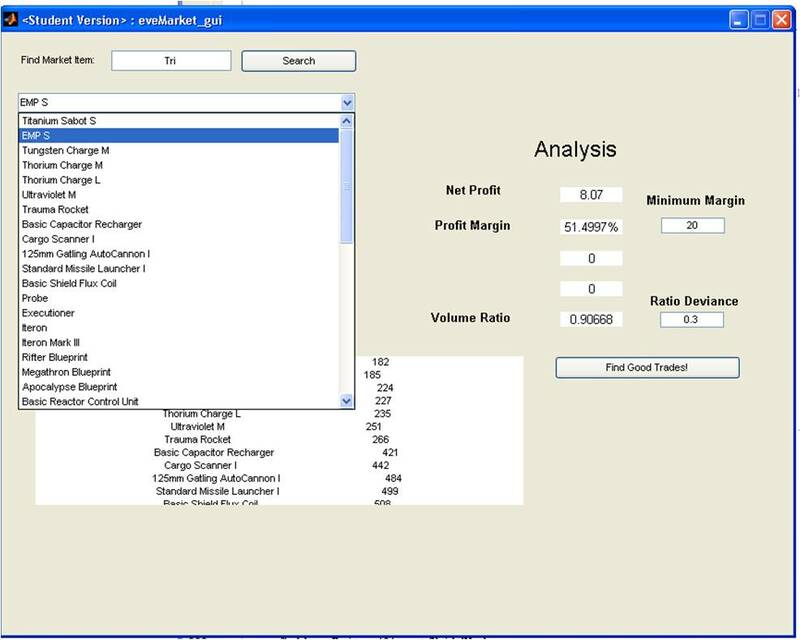 My own calculations are shown on the right, with profit margin for station trading. But scrolling through lists of items isn’t a very good way to find trades! I added the find trades button to scan the item list for things with high margins and good volume. That’s where I hit a bit of a block. Eve-Central doesn’t have data on the volume moved of market items, only the volume of orders listed. Unfortunately that’s not very useful information, since items with higher profit margins tend to move less and thus are not always very good trades. Without knowing how much of the product actually moves, it’s very difficult to determine if a trade is good or not. Nevertheless, I had come this far. Pressing the “Find Good Trades!” button scans the list for items with profit margins above a certain threshold. Hoping that I could get some use out of the volume data available, I decided items with an equal quantity of buy and sell orders would be more likely to be good trades and created a ratio between the two to test. Of course I was wrong. The analysis returns a list of terrible trades with good profit margins. But hey! I entertained myself for a day and now I can easily check prices in Jita without pulling up a browser.